If your abba Sky Lift only has a hand operated hydraulic pump you can simply upgrade it to be used by foot operation with this foot pedal kit regardless of your Sky lifts age. 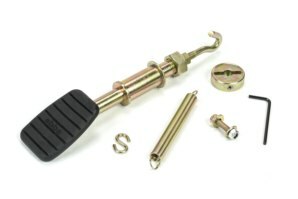 The kit includes the foot pedal itself, with a spring return and a valve release knob. This can all be fitted to your existing hydraulic pump in just a few minutes and will make lifting your bike much easier and quicker. Note: This is now included as standard on any new Sky Lift Purchase. Makes lifting and lowering your bike much easier. Can be fitted to any abba Sky Lift ever sold. Fitting is simply and be done in just a few minutes. 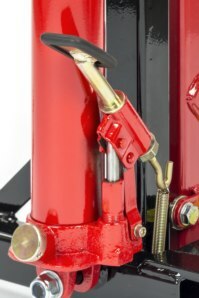 Eliminates the need for the hand lever to raise the machine, lowering the bike is done by the hand valve knob also supplied in the kit. Viewing records 1 to 2 of 2. Wanted to let you know that the foot kit arrived today. I am not over selling it by saying that it's AMAZING. I knew it would make working with the stand easier, but I didn't anticipate how much quicker it would be too. I haven't timed myself, but I'd easily say it's twice as quick for me. Getting more natural, quick, strong pumps with the leg and only having to do half of the motion because of the spring is night and day. I can't imagine being a SkyLift owner and not picking up the foot kit. While it is still a great stand without the kit, as the existing owners would already know, it truly does transform the machine. Great products paired with excellent customer service and continuous retrofittable product improvements based on customer feedback, purchasing from ABBA is one decision you will not regret. A brilliant add on for the Sky Lift, makes jacking up a bike a lot easier and quicker, no bending and the cost is excellent, fitting is very easy apart from the spring banged my fingers a couple of times, I ended up borrowing a spring puller, I should have done so before I started, it would have taken no longer than 10-15 mins with the spring tool. How do i know if this will fit my abba Sky Lift? The Foot pedal kit will fit any abba sky lift ever sold. How do i fit the Pedal Kit to my Sky Lift? Full instructions are included with the kit. You can also view and download them HERE if required. Got a Question about the abba Sky Lift Foot Pedal Kit? If you would like to ask us a question about the abba Sky Lift Foot Pedal Kit, simply fill in the form below and we will contact you within two working days. Want to tell a friend about the abba Sky Lift Foot Pedal Kit? Alternatively fill in the form below and we will send an email on your behalf to your friend, with a link to this page all about the abba Sky Lift Foot Pedal Kit.